Use one of these Aerospace Components Nitrous Bottle Billet Brackets to ensure the nitrous stays while you go. 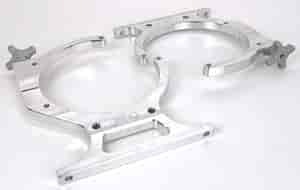 For single or dual 10-pound nitrous bottles, these lightweight billet aluminum brackets bolt down quickly and simply with the supplied hardware. Mounting rails sold separately. Nitrous bottle not included. Made in the U.S.A.